One statistic says that today a third of the city’s residents live below the poverty line. While the issue is widely discussed and highly politicized, solutions to affordable housing and better living conditions remain elusive. Social housing organized from the top down is an outmoded and endangered model – discussions are going on about revoking people’s right to social housing even as Mayor Bill de Blasio proposes an unrealistic plan to build 200,000 new social housing units. Bottom-up initiatives and pressure groups are trying to find loopholes in the system or seek to rewrite outdated laws. As policies come and go, residents struggle to find solutions while meandering through the labyrinthine system. The most radical proposals centre on housing cooperatives, community land trusts, and the power of self-organization. We asked ourselves how the vision of a future city built on greater participation by residents and the power of neighbourhoods would resonate with the everyday lives of residents. The bottom line is that for many people it takes personal ingenuity and good self-organization to survive in New York. We were interested in the bottom line – personal solutions, personal connections, and self-organization. To get the conversation started, we offered people sunflower seeds and some basic food items – large loaves of bread, cantaloupe and watermelon – things that needed to be divided to be eaten. Lunch became a performative action, with participants tearing off chunks of the bread with others and finding their own ways to open the big watermelons. First: press, smash, crack, cut, squeeze, puncture, or pierce. Next: break it into pieces and share it with friends and people you’ve just met. The participants performed modest, sensual acts of taking the whole thing in their hands, dividing it up, and sharing it with others, and so re-enacted the basic human condition of living together. The long table itself came together thanks to personal connections the students had made during our stay. 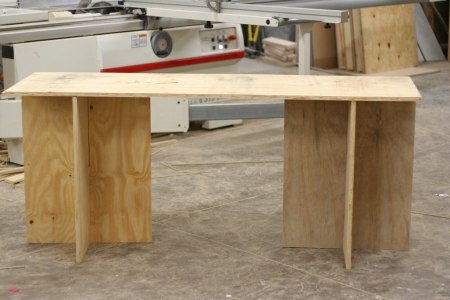 The plywood was donated by Materials for the Arts (MFTA); it was then cut at the RatRod Design Studios wood workshop two blocks from the residency in Brooklyn. The table boards and table supports were transported to and from Rivington Street by Alan Solomon of Sawkill Lumber, who also contributed the benches for the long table. After the event, the tables found a new home at About Time, a community garden in the making. The Invisible Lunch Discussions took place May 30 as part of the Ideas City Festival organized by the New Museum.